NOTE from DearMYRTLE: The following was received from our friends at Family History Expos. Please address all inquiries to Holly Hansen. 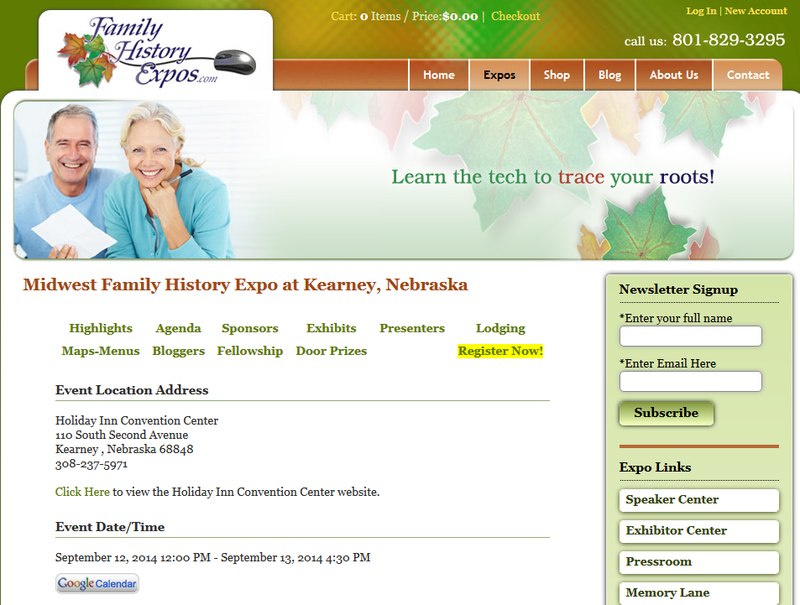 It is not too late to register for the Midwest Family History Expo this coming September 12-13, 2014 to Kearney, Nebraska. We have extended the Early Bird Pricing through September 5th. Don’t miss this exceptional opportunity to increase your research skills. Learn about sources you never knew existed! Gain insights on new strategies. AND, be sure to bring your personal research questions for our professionals to give you some expert advice on what to do next in your research! This usually would cost you from $50 to $75 dollars and is included with your registration at no additional cost! Read up on all presenters before you arrive so you know who is teaching the classes you really need. You will have the opportunity to win door prizes every hour we will give away 5 prizes valued at $100.00 or more; receive a great good bag loaded with fun stuff for genealogists. The grand prize includes 6 nights stay at the Crystal Inn in Salt Lake City and one week with Family History Expos professionals. This gift is valued at over $1,000 dollars. Don’t delay, register today! If you have already registered be sure to tell and bring a friend! We look forward to presenting you with answers to your questions and expert advice on how to find your ancestors now! Copyright © 2014 Family History Expos, Inc.